According to Quantum FFF Theory, the FORM and MICROSTRUCTURE of elementary particles, is supposed to be the origin of FUNCTIONAL differences between Higgs- Graviton- Photon- and Fermion particles. 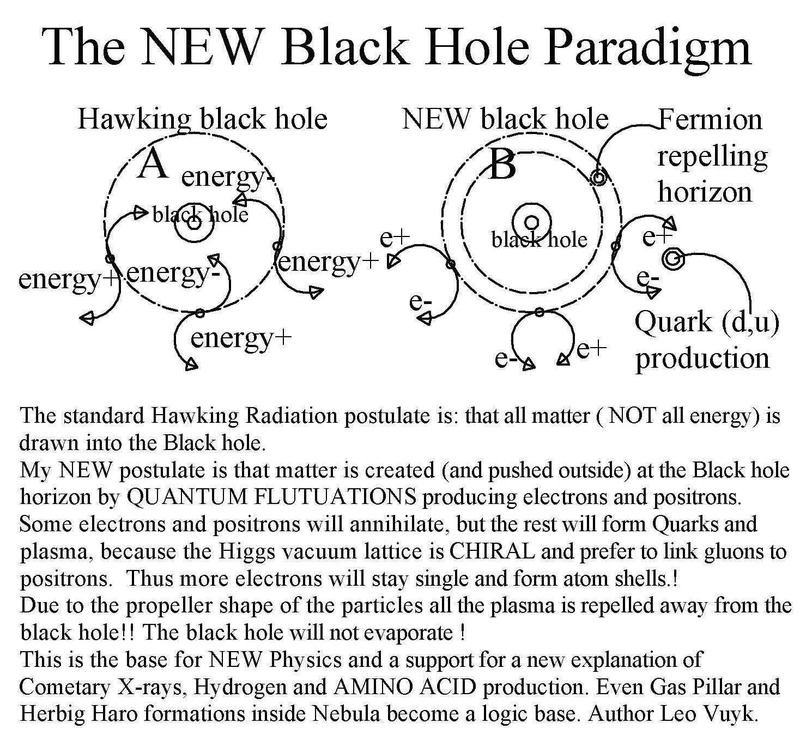 As a result, a NEW paradigm of splitting-, accelerating- and pairing Black Hole seems to be able to accelerate itself by a -Zero Point Energy driven-self created plasma tails ( by a new Quantum Fluctuation process), to form dumbbell systems, of two or even more black holes. Inside Nebula these dumbbell systems are called Herbig Haro systems. Inside the early universe however these systems are observed as dumbbell shaped radio lobes at both sides of early galaxies (Faint B3 radio galaxies). 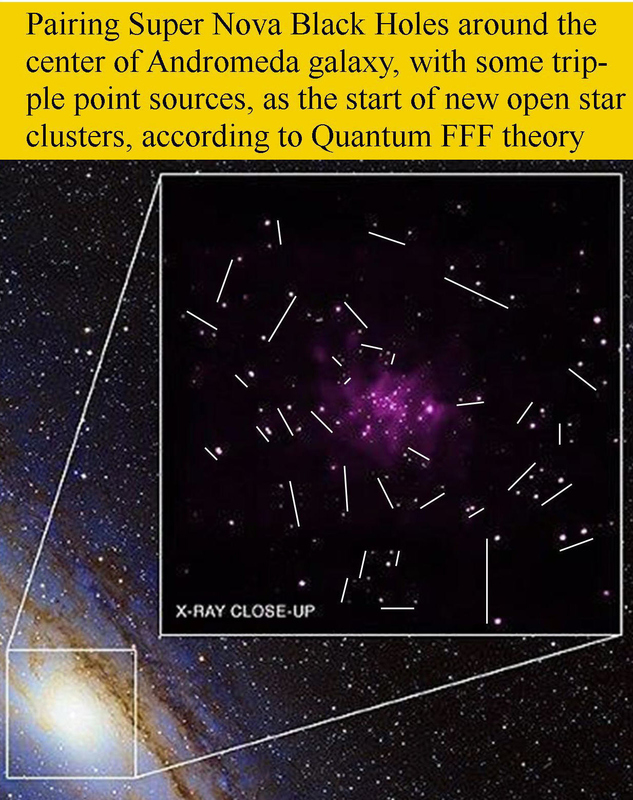 Recent cosmic observations of the infra red and x-ray background radiation of the universe by Chandra and Spitzer space telescopes (CIB and CXB), suggest that even direct after the big bang ABUNDANT black holes already existed. This can be interpreted as a support for a Black Hole splitting Big Bang and a Black Hole pairing Big Crunch before, thus there is reason to propose a cyclic Universe. 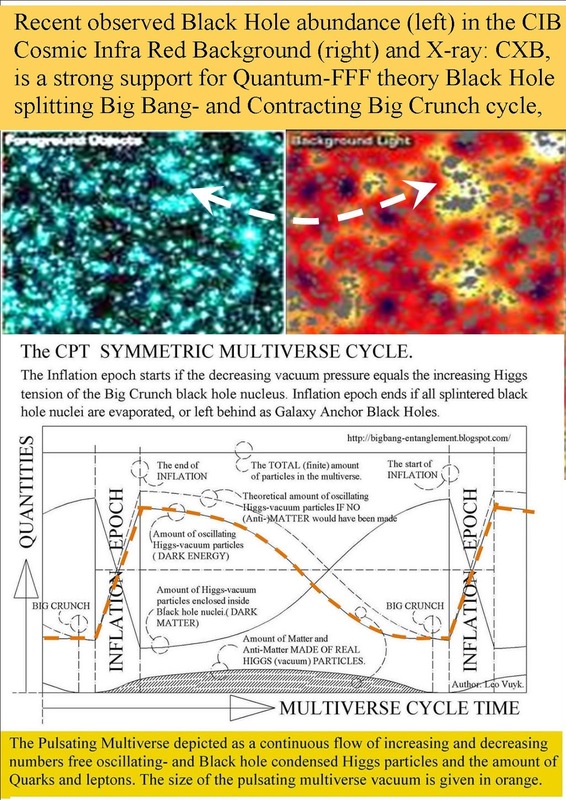 In Quantum FFF theory, the chirality of the universal vacuum lattice is proposed to be the origin of negative- or positive charged black holes and the origin of the formation of matter over anti-matter around negative charged black holes as in our universe seems to be the case. The chirality of the oscillating Higgs vacuum is supposed to be the origin of preferred Positron attachment with three different shaped monopole Gluon/photons for easy Quark formation without a lot of particle annihilation back into the Higgs vacuum. At the same time, the possibility of a chiral universal vacuum is reason to support the idea of a super symmetric raspberry shaped multiverse, with multiversal copy universes, instant entangled down to all quantum systems. Pairing SuperNova Black Holes around the center of Andromeda.